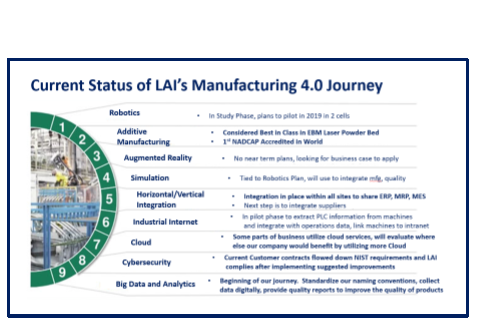 LAI is providing an update as to where we are in our journey of leveraging Manufacturing 4.0 within our business. We are making progress in creating value in our early efforts of implementation by initially focusing on improving our product quality. Our method has included using a big data repository and creating standard work by way of implementing statistical process control and analytics. The goal being, to drive real root cause identification and meaningful corrective action to drive down costs of rework and scrap on a couple of our largest production lines. Over the last nine months our focus has been to record machine output from our measuring equipment and analyze where our best opportunities were to improve quality. 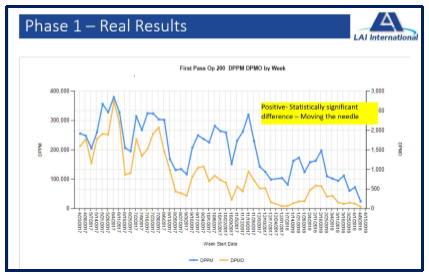 The chart below shows the improvements seen over recent months tied to efforts to adjust our machining processes to reduce defects. In less than a year, realizing more than 50 percent improvement in first pass yields. The team continues to drive more improvements in an effort to strive for a Six-Sigma production line. While there are plenty of tools and software to leverage in order to become a smart factory, or factory of the future, we are taking a measured and scaled back approach. To keep our business as competitive as possible, our goal is to ensure we take steps toward Manufacturing 4.0 while still realizing benefits to our Associates and Shareholders. We will only be making the investments necessary to improve our competitive position in the markets we choose to compete in. Our approach is to bring the culture of our company along on our quest to improve the quality of our products and services. By allowing our teams to focus on these elements, we ensure that we are maintaining our path to continuous improvement while integrating the elements of Manufacturing 4.0, taking the benefits as we manage the journey to the smart factory. To also provide a more proactive approach to our Total Productive Maintenance, we are piloting a process to extract the data from our NC Equipment. The purpose for this is to seek correlations between quality of the process and the environment being monitored within our machines. While many companies offer solutions to do this analysis, they are prohibitive. For us to outfit our five manufacturing locations, we have teamed up with a New England university to implement a more cost-effective method for a company our size. We are looking forward to the prospect of evaluating the data from our milling machines and chemical processing equipment. The results will allow us to see if there are correlations between how the machines perform and the quality of data we are collecting. The chart above shows the elements of the impact to the workforce. The leadership team is making a concerted effort to focus on skills improvement in an effort to support the new way our work will look after we declare standard work. That includes all the analysis and collection methods for each of our product lines when we install the “Factory of the Future”. This is the story we will be presenting to the audiences assembled for the SME’s Smart Manufacturing Series being held in Greenville, SC and Chicago, IL, a journey started 15 months ago and continuing into 2020 with our ongoing effort to make our small company more competitive in the market. 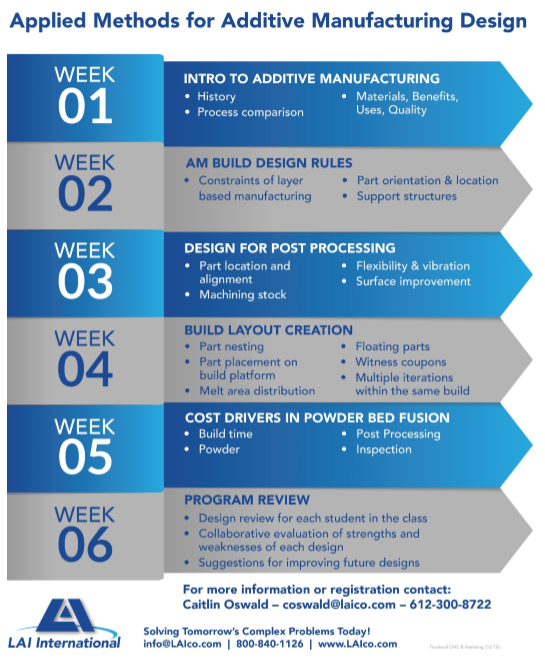 Find ideal additive candidates by sending your design, materials, manufacturing, and project engineers to this course built on a technical, hands on approach to learning about how to best leverage the advantages of additive manufacturing. The most effective way to apply a new concept is to use newly acquired skills in a familiar setting, and that’s the method employed by this class. Participants will identify parts they are working with every day and proceed through the full process of selecting a technology, making design changes, identifying post process requirements, and pulling together an entire business case for a component they are familiar with. Over the duration of the course, individuals or teams will apply new additive concepts to their parts, potentially identifying great business cases to move forward to improve quality, schedule, and cost. They will come out with a superior understanding of all the considerations and factors included in an additive manufactured component. The full curriculum includes weekly 1-2-hour classes, with smaller breakout office hours to review homework. The program can be customized with selected classes to meet your needs. When implemented properly Additive Manufacturing can significantly reduce material waste, the amount of production steps, inventory being held, and the number of distinct parts needed for an assembly. Don’t miss out on this opportunity to develop a winning Additive Manufacturing team. We are booking classes for 2019! For more information contact Caitlin Oswald – coswald@laico.com – 612-300-8722. Mike Koesling, LAI’s Vice President of Engineering and Business Development will be presenting on “Digital Transformation: Implementing Smart Manufacturing” at the Smart Manufacturing Seminar Series on Oct. 25 and Nov.15.